Inniscrone: Is the decision finally paying off? 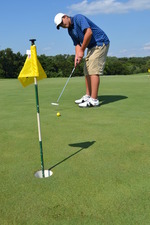 Golfers who play at the Inniscrone Golf Course have expressed their satisfaction with the course's design improvements. It is the middle of an August afternoon at the Inniscrone Golf Course in Avondale, and course manager Tom Bolko maneuvers a golf cart around the course's first hole. At this time of the day, the plush turf of the fairway is illuminated by beams of sunlight that have poked through the clouds, and the only sound is far-off chatter from business people playing hooky from work, approaching nearby bunkers. Since December 2011, when the Heathland Hospitality Group was named as the new management team at Inniscrone, the 18 holes that make up this course have served as Bolko's working canvas. When he inherited the management of the course, he saw fairways that were nearly devoid of grass, and greens that were sparsely covered. He saw bunkers that were virtually unplayable, and a clubhouse and maintenance shop that had been poorly maintained. to one of splendor, but like the rolling terrain of its fairways, the decision that the London Grove Board of Supervisors made five years ago that placed the ownership of the course in the township's hands has had its share of peaks and valleys. There have been some sizable losses, middling profits, a shattering legal mess with a former management team that cost taxpayers thousands of dollars, payments still due on a loan, and the nagging presence of an ever-present question: Should municipalities like London Grove Township be in the business of owning and operating a golf course? To some associated with the township, Inniscrone is a showcase of possibilities. To others, it is the equivalent of an inherited problem child whose promise may never be fulfilled. "If this operation doesn't work," Pickel added, "and year after year, it's not producing the profits that can go into reinvestment, and we have to keep borrowing from the township, then in my opinion, it's not an asset. It's a liability." In order to best examine the current state of London Grove Township's ownership of Inniscrone, it is crucial to start at its beginning. In 2009, then-board chairman Ed Bordas and his fellow supervisors agreed that the township would purchase the course for 750,000 -- a bargain price, given that several previous owners of the course had paid between $3.5 million and $7 million. Thus, the township had become Inniscrone's sixth owner. Bordas saw several factors working in the township's favor: Possible reductions in township property taxes; the benefits of additional spray irrigation on the property to the tune of 190 Equivalent Dwelling Units [EDUs] that the township could then sell off to the municipal authority for a bucket load of money; and the chance to right the wrongs of a business that had seen several owners come, fail and go in previous years. Soon after, the management team of KTEE & TTEE, Inc., began its association with the township for a four-year term that began on April 23, 2009. But by December 2011, their contract was terminated by the supervisors, for a myriad of reasons that soon became a year-long, festering wound between the township and the former management company. It also spilled into litigation between the opposing factions, one that ultimately rang up $62,000 in legal fees to the township -- all at taxpayers' expense. After the dust settled, the township and its insurance carrier paid a total of $41,000 to its former management team, and were also required to deliver several items of personal property to KTEE & TTEE, Inc., that the township originally refused to allow the former management team to remove from Inniscrone when their term of management ended. These losses, tacked onto the debt service the township is required to pay on loans for the original purchase of the course, had, in golf terminology, created a bunker of such red ink that many in the township began to wonder if the course would ever get out of the sand trap. Yet in the last year, at a time when naysayers had essentially left the course for dead, Inniscrone has slowly begun to turn itself around. A golf advisory committee, made up of members Doug Paine, Jim Cavanagh, Kay Wasno, Newt Brosius and supervisor Dave Connors, outlined a course for Inniscrone's future through a nine-part, five-year plan a few years ago that spelled out a course overview, market and competitive analysis, and a list of primary capital needs. It listed model courses in the area that Inniscrone could pattern itself after, as well as forumulated ideas on how the course should be marketed. High on the list were strategic objectives which the committee set out to achieve, including making improvements to the course; working with an effective management team, insuring best accounting and business practices; and establishing cost-effective course maintenance methods. As a result, Heathland, under Bolko's direction, has not only improved the course but initiated an e-mail marketing campaign, created a Facebook page, and established an advertising campaign with several leading golf magazines. Inniscrone is also a member of the Raspberry Trail, an arrangement with some of the leading courses of the Northeast and South that allows golfers to play rounds on participating courses on the Trail and receive a free fourth round. In 2013, for the first time in four years, Inniscrone saw a profit -- $19,620 -- working from an objective that focused on golf alone as the course's primary -- some would say only -- moneymaker. "We've grown the revenue base, slowly but surely," Bolko said. "It's not going to be completely turned around by a simple snap of the fingers. People know that they come here to play golf, not to eat and drink. They know what they're going to get. Secondly, we've controlled expenses. Everyone who has been hired here knows that the priorities are going to be on the golf course." "We've never gotten past five years of plans for the course, because of what we went through with the previous management company," Pickel said. "Now, we're working with Heathland to figure out what our immediate needs are. We're consumed with looking at 'right now.'" It is hard to imagine that revenues generated from greens fees alone will eventually enable the course to churn enough revenue to pay for capital needs such as maintenance, let alone funnel a portion of its profits back to the township's general fund. For now, at the top floor of Inniscrone's clubhouse, a small banquet room with a complete kitchen and bar area sits largely vacant, while similar spaces at nearby golf courses serve as restaurants, pubs and cafes. 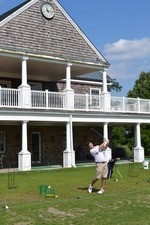 Within a short drive of Inniscrone, Moccasin Run Golf Club in Atglen has the Sand Wedge Grill; at the Wyncote Golf Club in Oxford, there is the Ball & Thistle Pub and The Rose & Thistle Room; guests and golfers at Hartefeld National in Avondale, now under the management of the ClubCorp family of golf courses, get to enjoy The Grille & Pub as well as banquet facilities. Just up the road, the Loch Nairn Golf Club in Avondale features the Farmhouse, Restaurant and the nearby Greathouse and Tavern. A major factor in putting an eating spot at the Inniscrone clubhouse on hold is due to the poor accessibility to the facility itself. Currently, the only way to get to the clubhouse from the Inniscrone parking lot is either by foot, or by golf cart. A bridge at the end of a downward slope on a golf cart path is too fragile to hold motor vehicles, and the cost to install a drivable road and parking lot adjacent to the clubhouse would be astronomical. "I didn't want to see us spinning our wheels on the golf end and opening a restaurant at the same time, and run the risk of having it fail," Connors said. "It's important to get the golf side of the course stable before we open this restaurant." Perhaps the most looming presence that could impact the future of Inniscrone is not whether it eventually chooses to open a pub or restaurant, but in the gloomy forecast of statistics. In a recent Wall Street Journal entitled "Game of Golf? Don't Ask Millenials," overall participation in golf fell for the fifth consecutive year, according to a study by the Sports & Fitness Industry Association. The popularity of golf has fallen dramatically among those in the 18-to-34 age group, and the National Golf Foundation revealed numbers that tell of a similar drop-off. Millenials, experts say, don't have the money, time and interest to invest in what many call a sedentary game, particularly when when they could be playing a more active, team sport for far less money. Although Connors admits that these figures indicate "that this industry is in trouble," he said the declining numbers of golfers is being seen at the private golf courses, not at municipal courses like Inniscrone. It's mostly a cost factor, he said, seen mostly in high membership fees. "You're seeing an exodus of people from the private golf market, and you're starting to see the municipal golf courses still holding water," he said. "Now, private courses are scrambling to maintain memberships. From that aspect, the market's changed tremendously. We can adjust our market price and get those golfers here." In the nearly three years since the Heathland Hospitality Group inherited the title of Inniscrone's management team, Connors has sometimes sounded like the lone advocate for an entity that has yet to yield anything close to what was originally predicted five years ago. In public and in private, he has repeatedly battled to keep Inniscrone in the best light, at the risk of severe criticism from the local media, local residents, and even his fellow board members. And yet, Connors continues to carry the torch for Inniscone's future, one that may have been dotted with many sand traps -- legal and otherwise -- but one that he said still has the potential to be financially viable. Because he does not see any negatives in the near future that could drain financial resources, Connors predicted that Inniscrone could eventually do well enough to turn a profit of between $15,000 and $50,000 a year, which may be able to see Inniscrone direct as much as $30,000 back into the township's general fund each year. "From my perspective, we're making the best of it," he said. "I'm not going to say that it's a great thing that the township owns this. There are a lot of positives to this ownership, just as I think there are a lot of negatives. If I was on that board [in 2009, when the township voted to purchase Inniscrone], I probably would not have voted to buy the course. But now that it's stable, I feel better about it. Back then, it wasn't stable. They bought a business that had failed ten times. "But we identified the problem, formed a golf advisory committee, established a five-year plan, formed a document, and most of that plan is on track for the future," he said. "I believe that this is going to be a success. This year looks like it's going to be another year in the black. I don't have any objective other than to make Inniscrone financially stable. I don't want this to be a drain on the residents of the township. As long as I see from a financial aspect that the course is able to re-invest in itself, it's the best of all worlds."